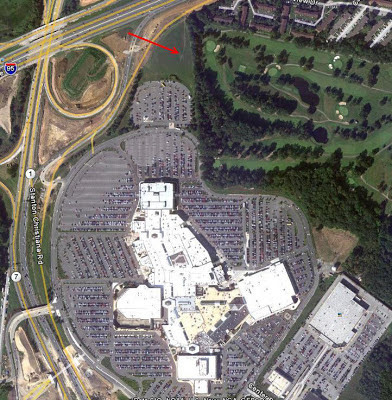 It's time for a new direction - will DelDOT lead the way? FHWA recently released its monthly travel-volume trend summary. 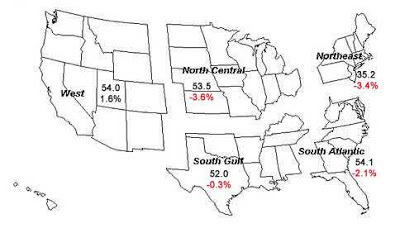 The first quarter of 2013 showed aggregate national VMT down .8% and per-capita VMT down 1.5% relative to the same quarter of 2012. 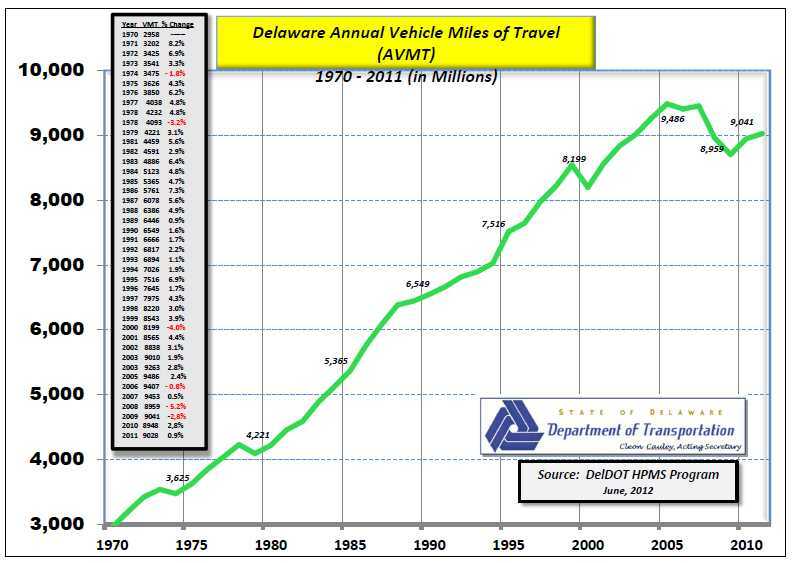 The summary is just the latest evidence that Americans are driving less than they were a decade ago, and factoring in population growth, total VMT is flat or even declining. We have never seen such a serious drop, from the dawn of the auto age through the early 2000s. So are we in a period of temporary flux that will ultimately pass, or has something really changed? I happen to think the latter, though this will surely face ad challenges from the auto industry. The signs are there that DelDOT is taking a more holistic approach to transportation planning and implementation. Much work remains, but we are slowly moving in the right direction. One thing advocates are always hoping for is that future projects for increased LOS (level of service) are revisited and carefully scrutinized. Are they really necessary, based on a projected demand that may not occur? 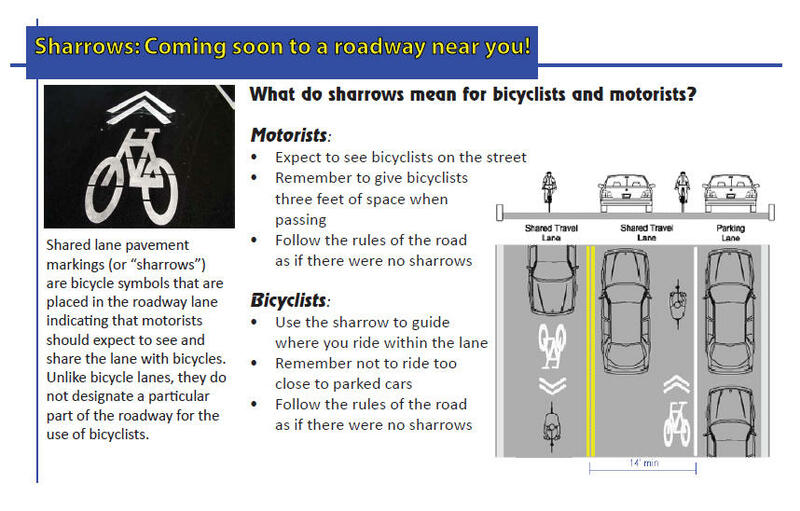 If so, is there an opportunity to amend these plans with bicycle/pedestrian/transit facilities? Sometimes these projects are 10 or more years in the planning, and according to the latest driving trends, might be curtailed, more multi-modal, or eliminated altogether as transportation needs evolve. A new report by the U.S. PIRG Education Fund and the Frontier Group argues that the change is a durable one. 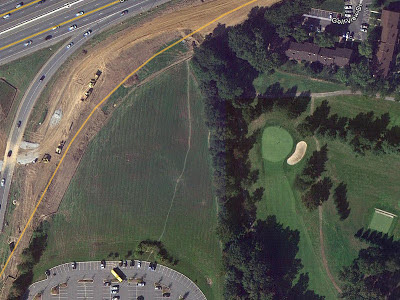 "Revisit plans for new or expanded highways. Many highway projects currently awaiting funding were initially conceived of decades ago and proposed based on traffic projections made before the recent decline in driving. Local, state and federal governments should revisit the need for these “legacy projects” and ensure that proposals for new or expanded highways are still a priority in light of recent travel trends." 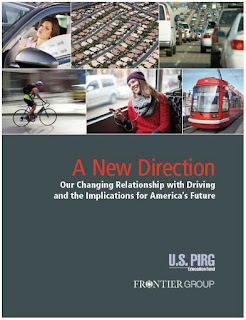 "Transportation policy in the United States, however, remains stuck in the past. 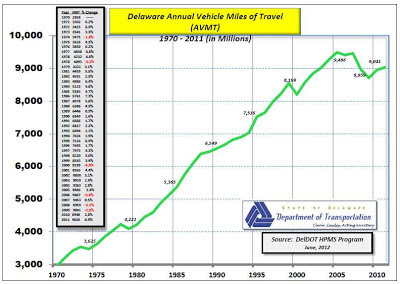 Official forecasts of future vehicle travel continue to assume steady increases in driving, despite the experience of the past decade. Those forecasts are used to justify spending vast sums on new and expanded highways, even as existing roads and bridges are neglected. Elements of a more balanced transportation system - from transit systems to bike lanes - lack crucial investment as powerful interests battle to maintain their piece of a shrinking transportation funding pie." "The time has come for America to hit the “reset” button on transportation policy - replacing the policy infrastructure of the Driving Boom years with a more efficient, flexible and nimble system that is better able to meet the transportation needs of the 21st century." "Traffic congestion has fallen. According to data from the Texas Transportation Institute, Americans spent 421 million fewer hours stuck in traffic in 2011 than they did in 2005. Further reductions in driving could lead to additional easing of congestion without massive investments in new highway capacity, as long as roads are maintained in a state of good repair." 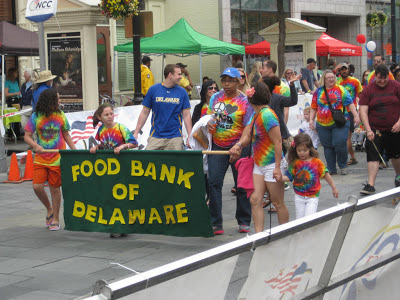 Statistics for Delaware through 2011. VMT has begun trending up a bit since the end of the Great Recession, however, this could change drastically as gas prices remain vulnerable to supply disruptions and the decline of easy oil. The map below shows estimated Vehicle Miles Traveled by Region, as of March 2013, in Billions. In red is the change in traffic volume as compared to same month a year ago.The South Atlantic region, including Delaware, saw a 2.1% drop in aggregate VMT. 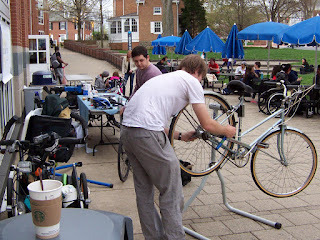 By Amy Wilburn – Back in 2008, Delaware ranked 31st in the League of American Bicyclist’s Bicycle-Friendly States program. It was disappointing and embarrassing, and was one of many factors that helped motivate us to work harder. Our ranking shot up 22 points in 2009 to 9th place, in good part due to the Complete Streets policy (creation, as it was not yet implemented) and the first bike summit (a joint effort by representatives from WILMAPCO, Dover/Kent MPO, DelDOT, Delaware Bicycle Council, Bike Delaware, Parks and Recreation, WCBC, Sussex Cyclists and others). In 2010, we dropped slightly to 10th and then even farther to 18th in 2011. We moved back up to 10th in 2012. This year (2013) we are 5th, in good part due to the progress we’ve made but also based on the hope that good intentions will translate into a more bike friendly state. And that is important to keep in mind. Ensuring that good intentions translate to a bike friendly environment is definitely possible, but it will not be easy. It will take the efforts of many organizations and individuals on many fronts to achieve. 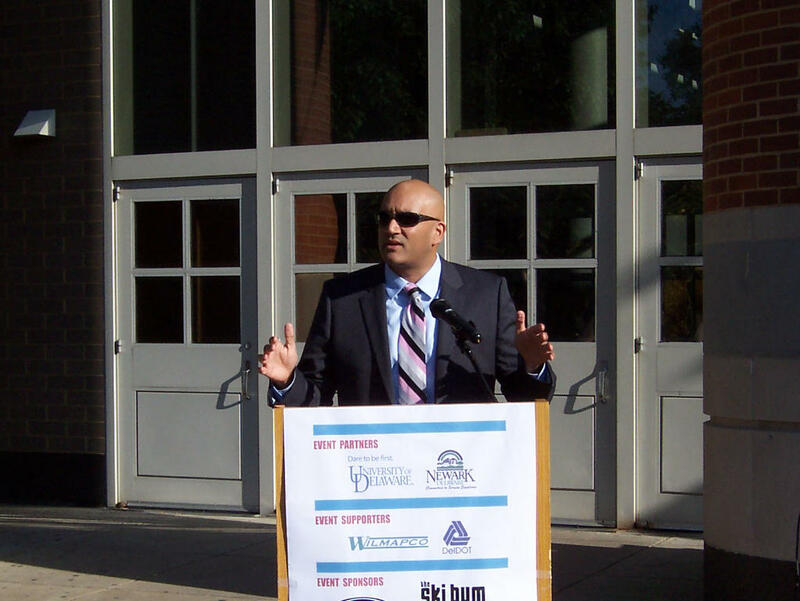 Over the years, numerous agencies worked to build a foundation. Further progress was made once we had a bike friendly governor who initiated Complete Streets and the First State Trails and Pathways Plan. In addition to funding, legislation and infrastructure, we have made inroads in education, enforcement and encouragement. But we have a long way to go. Funding is necessary but that alone won’t do it. First, we have to ensure that whatever funding we receive is put to best use. Certainly, we should consider recreational opportunities since they impact quality of life and health. We also need to encourage more people to use their bikes for transportation, which will help our citizens, communities and environment in so many ways. That is perhaps the most difficult challenge, since it is impacted by so many factors, including attitudes, knowledge, infrastructure and land use. In terms of infrastructure, we need to make best use of the facilities that already exist including our roads, since this is the quickest, cheapest, and in many cases, the only practical solution. It is important to create networks that include viable, best practice facilities on a combination of arterial roads, low-stress and neighborhood roads, and trails in order to allow people to travel from their homes to destinations like work and shopping and school. Bike friendly communities have discovered that providing more than one viable route between point A and point B - as we do for motorists - increases bicycle mode share. It is unrealistic to think that we can create networks with only one type of facility due to the hostile nature of some roads, the lack of land to construct trails, the length of time it will take to create trails and similar facilities, and the large amount of money needed in some cases. We need many tools in our toolbox. Maybe someday we will create a utopia. But for now, we should work on the short term needs as well as the long term goals. 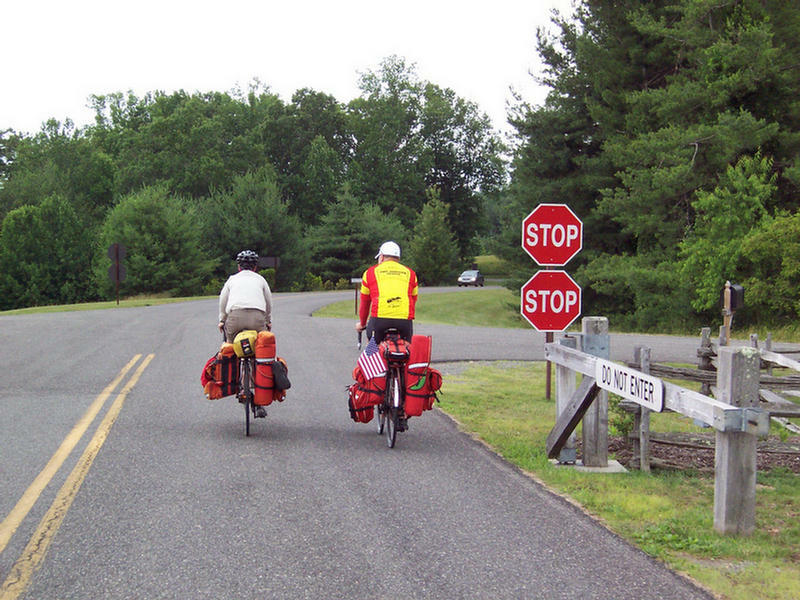 We should correct deficiencies, often minor, that create barriers to usable routes. In this way, for a relatively low cost and within a short period of time, we can create usable facilities that the majority of cyclists–from road warriors to the timid– will find adequate, if not ideal. Infrastructure involves more than trails and roads, however. 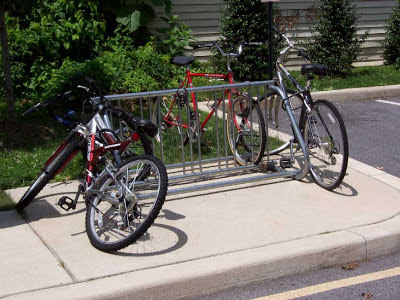 Commuters, shoppers and school students need a safe and accessible place to park their bicycles. Commuters need a place to shower and to change into work clothing. 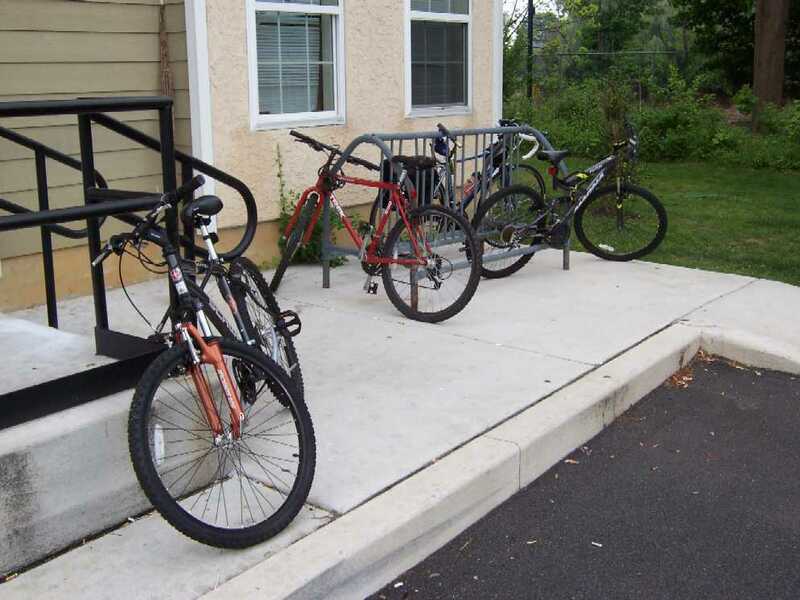 Providing these facilities is another quick and relatively inexpensive way to make biking a practical choice. The way we conceive of and build our environment also needs to change, to accommodate a bigger picture that makes mass transit, walking and biking feasible, safe and convenient. Our communities and counties have the biggest input into our built environment, although we the people are also an important component since we choose how and where to live. Attitude is truly critical as well. 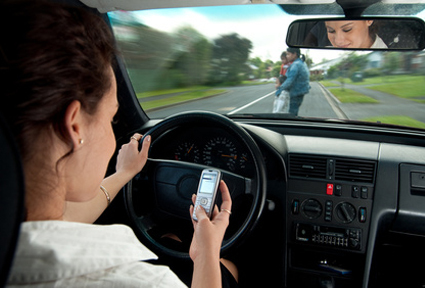 A car culture combined with exaggerated fears and numerous misunderstandings is a serious barrier. 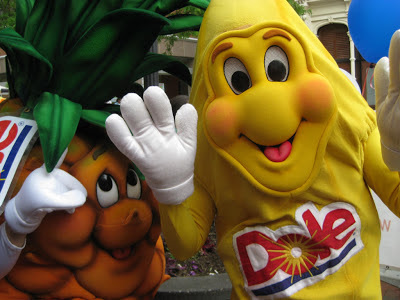 It is important that we don’t allow fear or stereotyping to become the excuse for our choice. 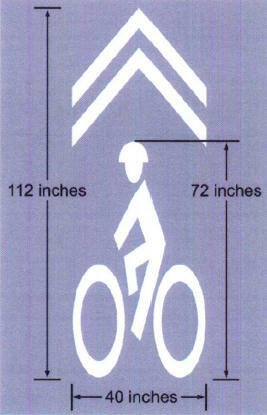 We need to support, encourage and educate the cyclists who are currently on the roads. 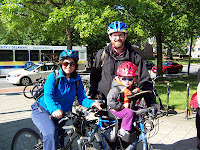 Those of us who bike serve as role models and show other interested people that it is both fun and feasible to bike for transportation and recreation today. 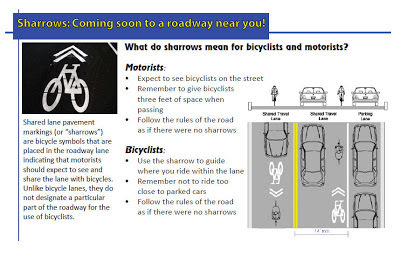 Motorist education as well allows people to share the roads. And publicizing and enforcing our laws is critical. Only when people take driving seriously, whether by motor vehicle or by bike, will we be able to make transportation safe and comfortable. All transportation. Progress is slow. 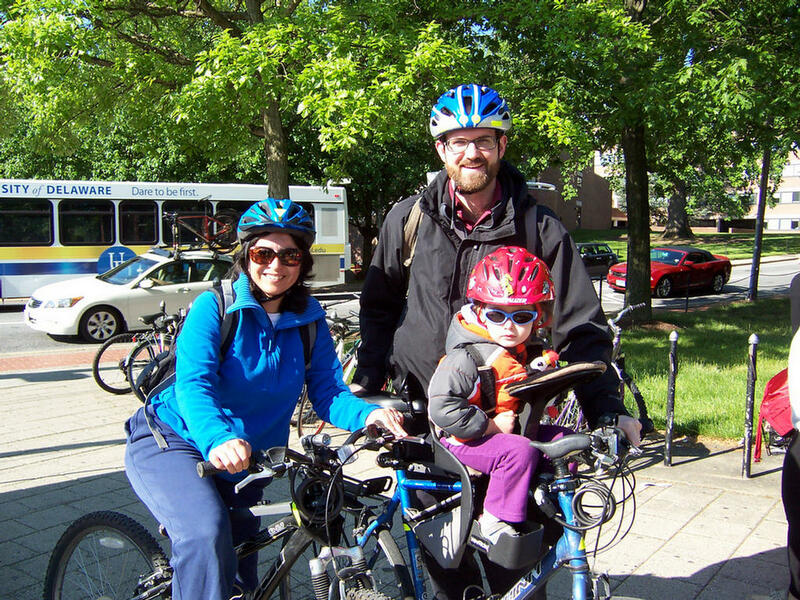 It is a nuts and bolts, one foot in front of the other approach coupled with both a realistic vision and visionary goals, that will allow us to achieve a truly bike friendly state. It’s complex, and it feels pretty daunting. You know what, though? Change is slow, but sometimes after years of establishing a foundation, it takes off and moves far more quickly. History is replete with examples. I find it helps to think of change as more exponential than linear. 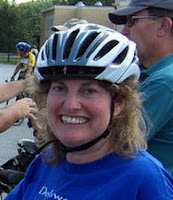 - Amy Wilburn has been Chair of the Delaware Bicycle Council since 2008. 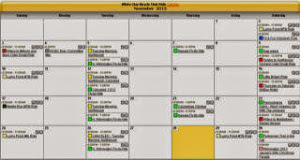 When: Thursday, May 23, 2013, 4:00‐5:00 pm. Meetings are open to the public - please come join us! • Review: Subdivision and Development Regulations Amendments: Bicycle Storage Facilities. 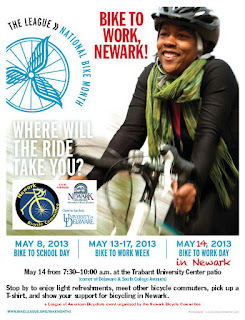 • Review: Newark Transportation Plan (2011) Implementation Priorities. Meetings are held monthly at WILMAPCO on the 3rd Thursday, 4 p.m., click here for directions. 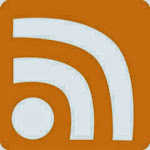 Send us an email to be added to the committee email list. 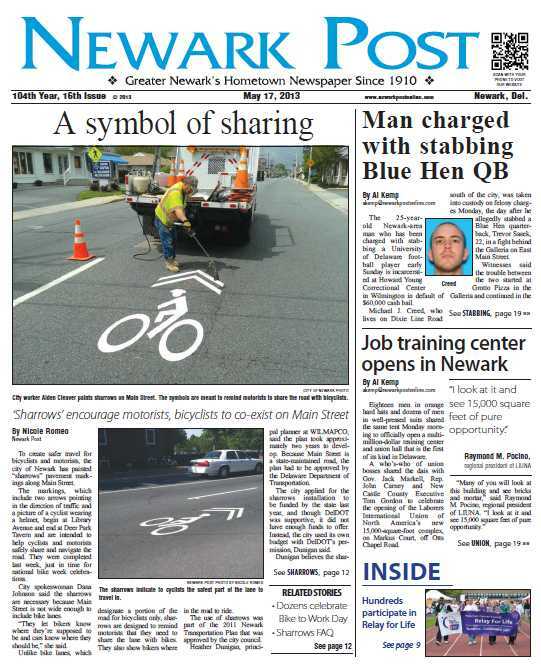 Check out today's edition of the Newark Post, both the front page and page 12. 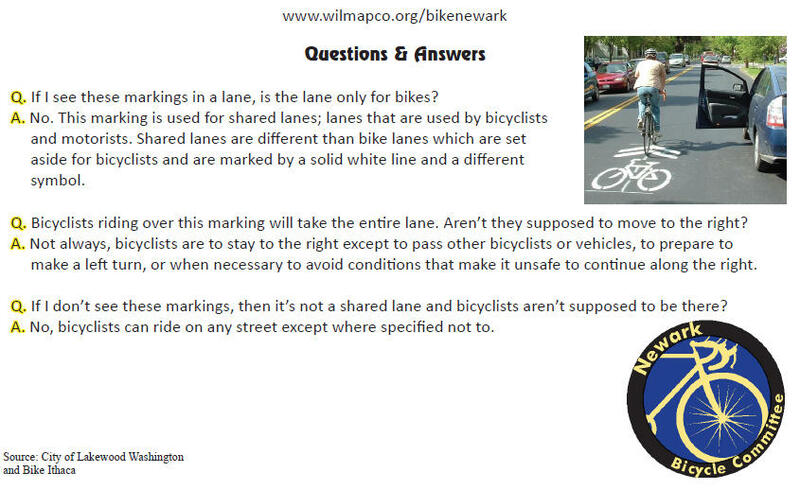 The City of Newark has done a fabulous job on the education front, getting the word out to major media outlets on the meaning of sharrows. 8:09 a.m., May 16, 2013 --“Leave the car in the driveway and get some good exercise” was the theme of Bike to Work Day, celebrated early Tuesday morning, May 14, on the patio of the Trabant University Center on the University of Delaware campus in Newark. 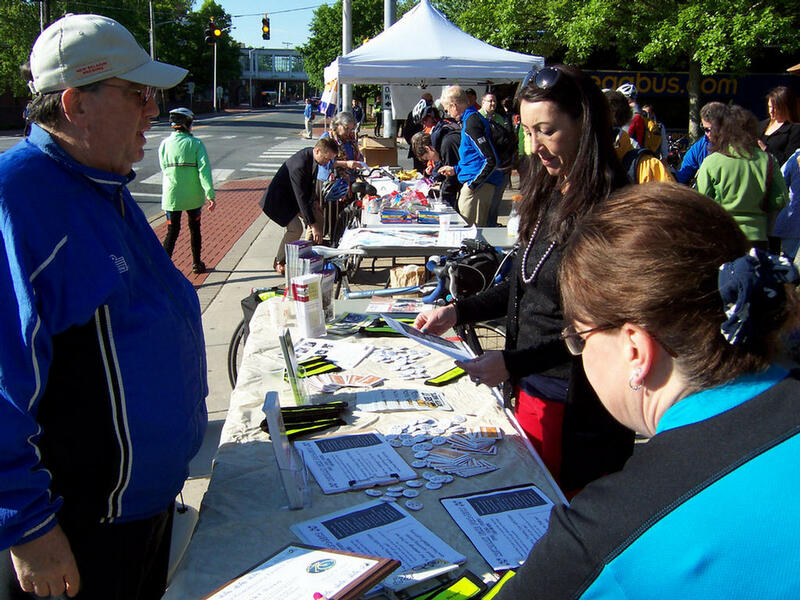 Drawing more than 50 enthusiasts, the event showcased National Bike Week (May 13-17) in the city, which is currently a League of American Bicyclists-designated Bicycle Friendly Community. Attendees enjoyed crisp temperatures and tasty refreshments while listening as UD President Patrick Harker and state and local officials endorsed efforts supporting the many benefits of alternative two-wheeled commuting. 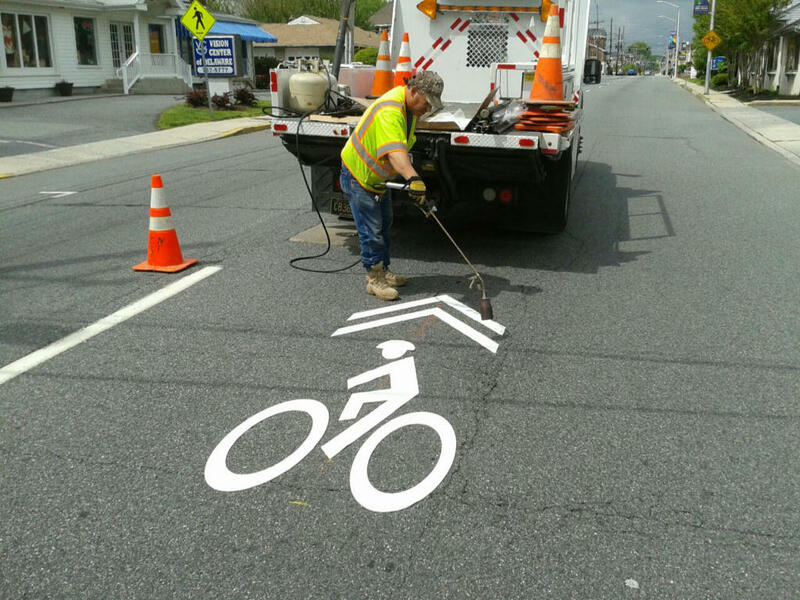 In time for national Bike to Work Week, Newark is installing “sharrow” pavement markings along East Main Street, reminding motorists and bicyclists to share the road. City workers began placing the markers along the one-way corridor Thursday between Library Avenue and the Deer Park Tavern, according to city staff. 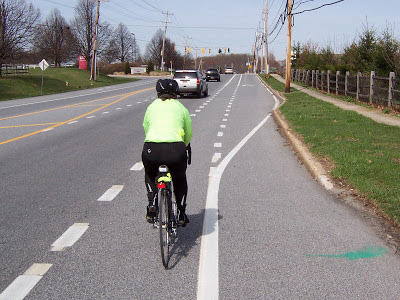 “Sharrows help position bicyclists within the lane and alert motorists to the presence of bicycles,” said Heather Dunigan, a planner with the Wilmington Area Planning Council. 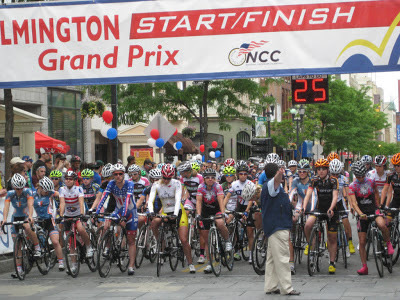 Are you new to riding on the road in groups and want to be more confident? This class is for you. This one day course is for adults who would like to cycle on the road in a group but feel they lack the skill and knowledge to do so. We will provide instruction and guidance in the following areas: bike selection, basic bike maintenance, clothing and accessories, bike handling, traffic skills and riding in a group. The course will include classroom, as well as, parking lot and an on road group ride instruction. 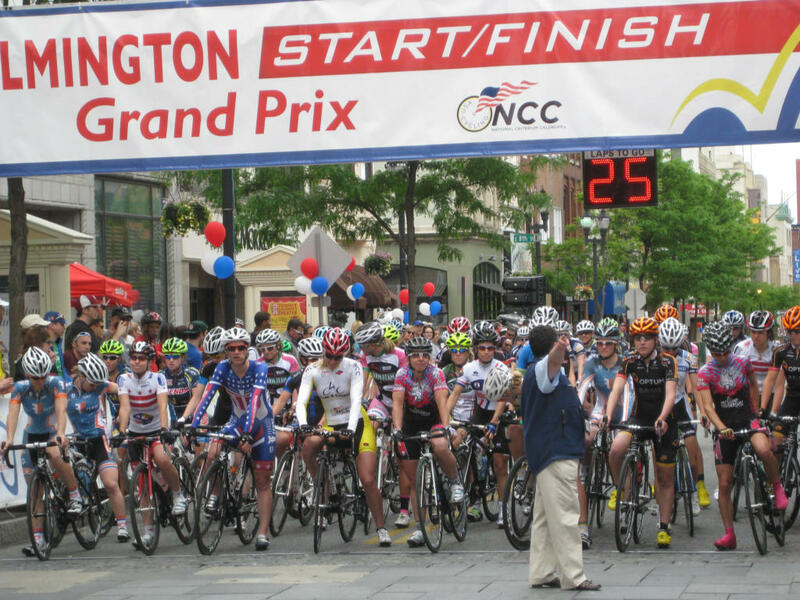 To reserve a spot, you must be age 18 or older, and bring your own bike, preferably a road bike or hybrid, helmet and comfortable biking clothes. 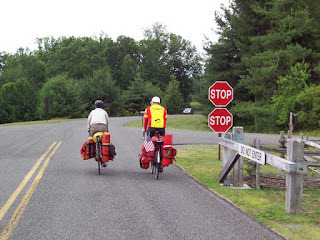 Bicyclists have fun when they cycle with skill and confidence! 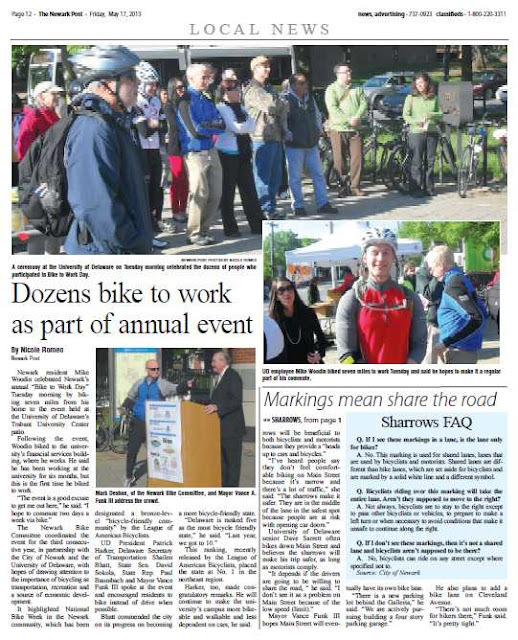 By Angela Connolly -- Frank Warnock, Chair of 1st State BIKES, has been bicycling since he was old enough to deliver newspapers and ride to elementary school. 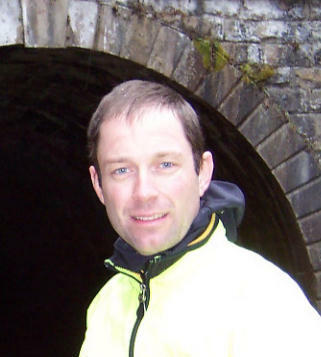 Growing up in Radburn, NJ, he joined the Bicycle Touring Club of North Jersey in 1984 and began leading weekend rides and multi-day tours while still a teenager. 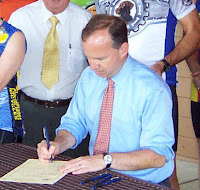 He went on to serve as Chair of the club's Legislative Action Committee during the early 1990s, and by the mid-90s, was chairing some of the club's major events and rides. 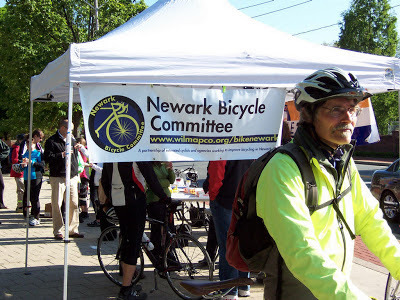 Frank relocated to the Newark DE area in 1996, and immediately joined the White Clay Bicycle Club where he again started volunteering and leading rides. In 1999, he went on to establish WCBC's Shore Fire Century, and continued to chair/co-chair the event through 2003. 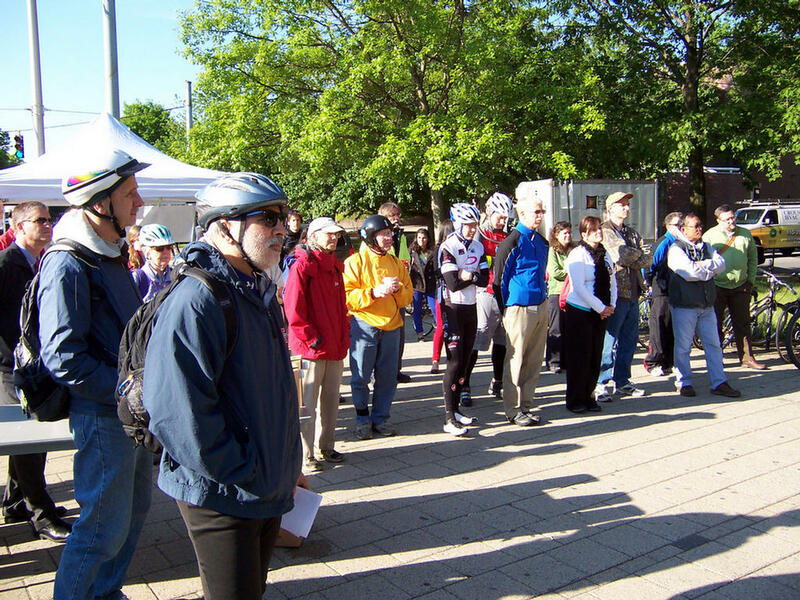 In 2006, he began attending meetings of Bike Delaware to address statewide advocacy issues, and constructed their first website in 2009. As an advocate, he enjoys a number of successes, which include State DOT policy and guideline reforms in the interest of bicycle and pedestrian safety. 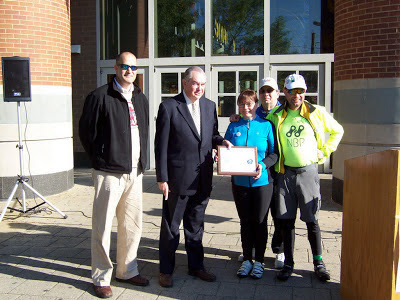 Not only does Frank bike to work almost every day, but he has a penchant for mentoring others, and it was this dedication that earned him Delaware's Commuter of the Year award in 2010. He chose not to renew his position on Bike Delaware's Board as of January 2013, and instead took a position as lead mechanic, training instructor, and board member at the Newark Bike Project through mid-2014. 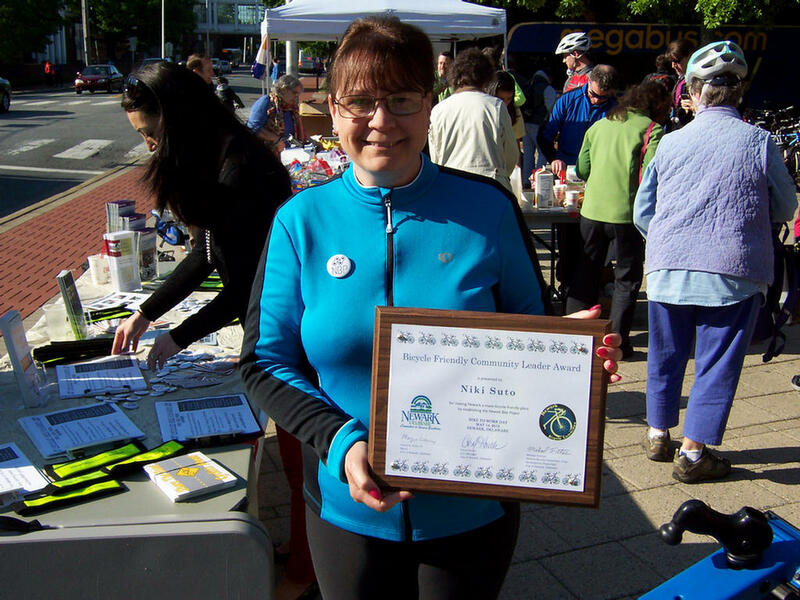 His last and final effort with bicycle advocacy was the creation of this blog, 1st State BIKES, to address road safety and advocacy that are of non-importance to Bike Delaware. 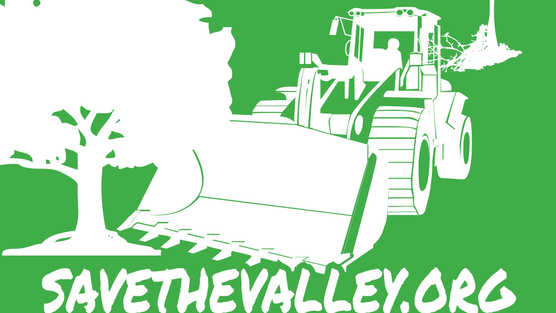 By August of 2015, Frank was co-founder of Save The Orphanage Property (STOP), an organization dedicated to saving Ogletown's last remaining large tract of open space, wetlands, and critical habitat area. With hundreds of followers and the media spotlight, it was quickly recognized as one of the most successful land use causes in the State. Frank, along with other land use advocates, then went on to advocate at the State level for dedicated open space funding in the 2016 Bond Bill, and to have open space included as a plank in the Democratic Party's platform. 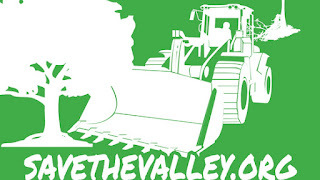 On November 20, 2016, Frank accepted the nomination to a board position with the Coalition for Natural Stream Valleys, the organization mainly responsible for the acquisition and creation of White Clay Creek State Park, among others. Unfortunately, the STOP campaign failed under entrenched govt corruption, resulting in his resignation from the CFNSV and from land conservation, advocacy, and activism altogether. 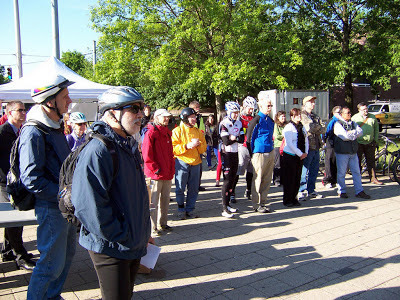 Poster's note: The purpose of this blog is to address advocacy issues as they pertain to bicyclists who ride for transportation today, in the built environment. Because that is all we have, and will continue to have for the foreseeable future.